Spring is here & that calls for lazy evenings on the patio eating dinner & watching the kids run around the yard until the sun goes down. We only get a few shorts weeks here in Texas to enjoy the Spring weather before summer hits in early May & we all melt. Even when the mosquitos are biting & the humidity makes it hard to breathe, I still love being on my back porch with family & friends & soaking up the endless days. I don’t know about you but my back patio is feeling a little tired & not to mention, covered in pollen, so I created this design board to give me a little inspiration for my own patio & these gorgeous days ahead. Some affiliate links were used on this blog post, which means that we make a small commission from your purchase (at no cost to you). Thanks for supporting Moore House Interiors in this way! And what would Spring be without a delicious lemonade? Our friends over at The Vintage Round Top & Women of Today prepared this lemonade recipe for us at their Social Media Marketing + Branding Workshop this spring & we had to share with y’all! Scroll down for the recipe! Your favorite lemonade—try to find a nice lemonade, something other than Country Time y’all. A splash of gin if you’d like to add a little punch! 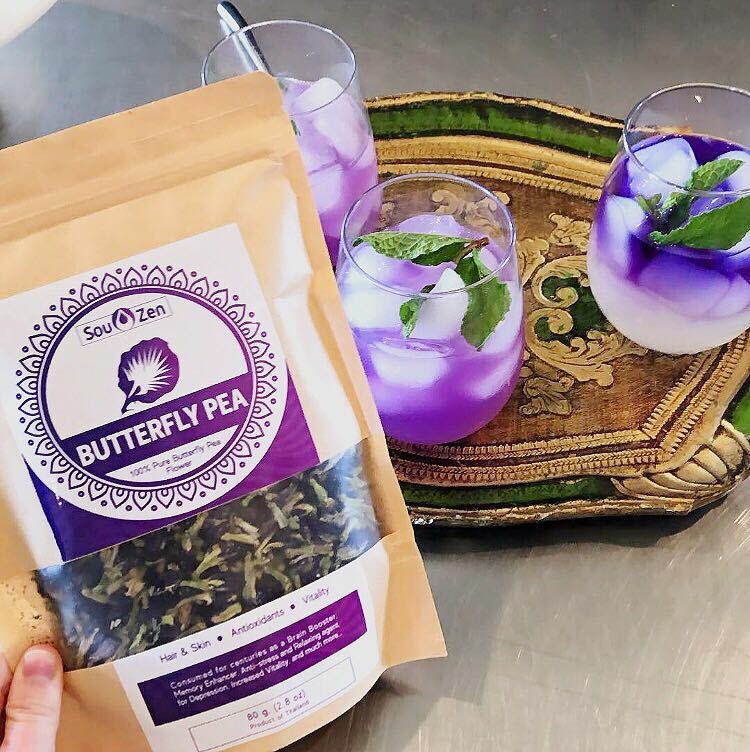 Simply soak the Butterfly Pea flower in water until it has developed into a deep blue color or mix the Butterfly Pea flower powder with water as instructed. Put ice into these perfect summer glasses. It’s very important to have a glass full of fresh ice that you pour the lemonade over in order for the blue/purple color to float above the lemonade. If your ice has melted and it’s watered down, the colors will blend rather than stay separated. Pour your fancy lemonade over your ice. Take your blue liquid & slowly pour it over the ice/lemonade. The blue should stay separated on top, as shown in the glass to the far right in the photo above. Top with a fresh mint sprig & splash of gin (or whatever you prefer!) to make the most refreshing & fun summer drink! This is a great little party activity if you’re hosting. Set up a little bar in corner with all the supplies & instructions & let your guests have some fun! Be sure to tag us in any of your patio or lemonade photos using @moorehouseinteriors!